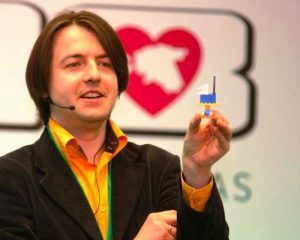 160 Estonian visionary thinkers and opinion leaders used LEGO bricks to build their country vision. The Development Fund‘s FUTURES FORUM 3 “Globally Competitive, Locally Attractive Estonia in 2018″ took place on 6 May 2010 at 10-17 at the Chamber Hall of Theater “Estonia” This year’s Futures Forum was the kick-off for the wider discussion of Estonia’s mid-term future. The purpose of the debate is to reach a shared vision about the possible sources of economic growth for Estonia in rapidly-changing world. During the second half of the day the participants received LEGO SERIOUS PLAY exploration bags to come up with their vision for country mid-term future for 2018. They were sitting in tables of 10, each lead by qualified instructor who was previously trained by Marko. They had 3 minutes to build their individual models: “How do I see Estonia in 2018″. Thereafter each one of the participants described their models to the other members of their group. The groups spent an hour to come up with shared vision and identifying primary success factors. Finally a number of groups presented their understanding to the other participants. The results of visioning task are available at the Development Fund website.